While flying to Los Angeles, Sun is recruited by Charles Widmore to kill Ben Linus. Jack goes to meet Kate near LAX and tells her that Locke is dead, and that they're supposed to go back to the island in our infamous first flash forward scene. She rejects him and drives off. Sayid breaks into Santa Rosa to get Hurley out, somewhere safe. Kate is visited by Claire in a dream, who tells Kate not to bring Aaron back to the island. 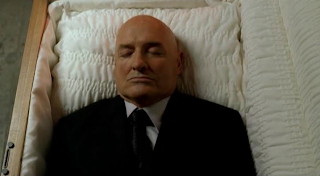 Jack goes back to the funeral home to see Locke's body, where he runs into Ben, who tells Jack that they all have to go back to the island. Sayid takes Hurley back to his apartment, but is attacked by two men and shot with a tranquilizer dart. Kate is visited by two men who question the relationship between Kate and Aaron, leading to Kate taking Aaron away. Hurley takes Sayid to his parents' house to hide Sayid for the time being. Ben stores Locke's body at a butcher shop while he works on rounding up everyone else. Hurley's father takes Sayid to Jack so that he can fix him. Ben comes to Hurley's house to take him back to the island, but Hurley doesn't want to have anything to do with Ben and instead gives himself up to the police, who believe he murdered the two people at Sayid's apartment. The episode runs 56:52 and is 457MB to download. You can stream the episode below (via Facebook), or go here to use torrents (better quality, recommended) to download the episodes to your computer.